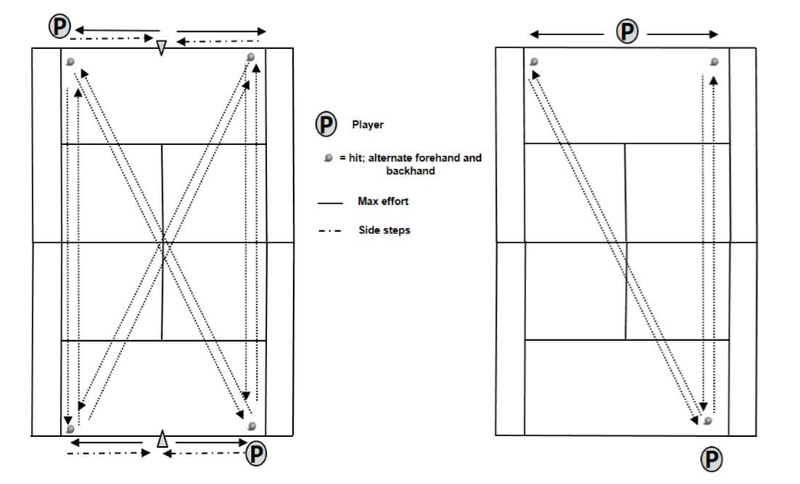 Many coaches and trainers in the tennis world believe this is done by building a ‘base’. Truthfully, if we perform training that’s long and slow, simply put, we will become slow. Muscle tissue is extremely plastic - in other words, adaptable to a particular stimulus. If we train slow - by running long or performing sloppy side to side drill work - we’ll develop players with poor and inefficient movement patterns. The muscles will thus adapt by undergoing a fast to slow fibre transformation. And if the athlete is already a ‘slow’ twitch’er’, that shift in fibre utilization will only worsen. How many accelerations (or decelerations) are players taking during each point? How many times are they changing direction during a game, set or match? I’m less concerned with total distance covered in a match and more concerned with the specific details of each distance during a stroke cycle (split, move, hit, recover). Heart rate data can also be misleading as it doesn’t give justice to the demanding movement characteristics required in our sport today. The typical academy setting sees players performing countless on-court hours which include a variety of high-intensity drilling...AND, on top of that, more off-court ‘conditioning’ training. A variety of modalities are generally prescribed - bike, track runs, shuttle runs, rowing machine etc - with the basic logic being that the interval nature of these tasks will improve biomarkers that reflect a developed aerobic system. While there’s nothing inherently wrong with performing interval work off the tennis court - there is a problem. Prescribing these various high-intensity OFF court sessions regularly when players are already taxing their physiology ON the tennis court. Anecdotal evidence from elite basketball players (Pfaff 2017) reveal that blood biomarkers and VO2 values are highly developed in the absence of off-court basketball training. In other words, basketball players have an extremely developed aerobic system without actually performing any aerobic work - whether that be in the form of steady state runs or interval training. Do We Even Need to do Off-Court Conditioning Work? Must players go through additional suicide drills, shuttle runs and the like - to, in essence, challenge their cardiovascular capacities? There’s no question that being able to move explosively and repeat these movements over and over, is an important feature in elite tennis players. Too often, however, coaches are concerned with the repetition part of the equation, and not the explosive part. According to a 2016 study by Fernandez-Fernandez et al, aerobic fitness in elite juniors can be improved by either mixed training (MT) OR via tennis-specific drills (DT) training. During 2 sessions a week, both groups performed regular tennis practice. At the end of each tennis session, the MT group went through a series of tennis drills and followed that with a series of repeat sprints over a distance of 20 to 30m. The DT group, on the other hand, only performed tennis specific drills (diagrams below). While both groups improved, the MT group did MUCH better on almost all performance measures and in particular, CMJ (countermovement jump), a 505 agility test, VO2peak and the 30-15-IFT (intermittent fitness test). The latter two being measures of aerobic fitness. In a more recent study, (Kiilit and Arslan 2018), 1 group of elite juniors performed on-court tennis drills (OTT), while the other group (HIIT) performed a high-intensity interval training protocol only. For both groups, these sessions were performed after on-court tennis training and were prescribed 2-3 times per week over a 6 week period. ...as striking as it may be, or maybe not so striking, the OTT group dramatically improved their technical and agility performances. The HIIT group did ok too - which we can safely say is due to their tennis practice and not their HIIT training - but not nearly the improvement which was seen in the OTT group. It shouldn’t come as a surprise that more tennis drilling will have a positive effect on technical aspects...but it may come as a surprise that aerobic factors can be improved through tennis. So What Should We Prescribe to Our Players? Before we can answer that question, we should ask ourselves a few others? Is my player truly lacking conditioning? Or are they weak and slow? A player will fatigue a lot sooner if their nervous systems are tapped out. Without a developed nervous system - which is needed to move explosively, change direction on a dime - what are we truly enduring? From my experiences, tennis players are severely undertrained when it comes to bioelectric (nervous system) qualities. These qualities are primarily developed through repeat accelerations, high-powered plyometrics and weight room work. This doesn’t mean we should train like a sprinter or a linebacker. Each of the aforementioned qualities can be designed in creative ways to handle the inherent nature of tennis movements and work to rest ratios that reflect match dynamics. Personally, I’m not a big proponent of any work off the court which is greater than 50m in distance. And even that distance is prescribed very infrequently, for very specific reasons, for very specific individuals, AND it’ll involves a change in direction. I never program any speed or acceleration work which is greater than 30m. I believe in the success of a program that includes a mix of on-court specific drill work combined with off-court repeat sprint drills. Both of these exercise types should include short periods of work (15s) and short to medium rest intervals (15-30s) - when trying to affect physiology. And the proportion of time spent in each changes depending on the time of year. The work by Fernandez-Fernandez (2016) revealed a better adaptation to a mixed design... Kilit and Arslan (2018) found both groups improved equally... It gives an indication that both on & off court work should be prescribed AND this work must be biased to what a tennis player needs. Note, Kilit and Arslan’s interval work consisted of running around a 400m track for a work to rest ratio of 30:30 - it would have been interesting to see how these results differed had they a) included a work portion that was shorter and more intense and b) if a combination of on-court and off-court work was prescribed. Can we work on accelerations, repeat sprint ability and technical factors with one simple drill? Of course there is a time and place to implement the appropriate training items BUT, all players - especially juniors - require general prep development at various times of the year, which target the tasks we’ve outlined above. This is what you’ll see in High-Performance Preparation. It’s a program that targets the preparation of players during the general (off-season) period. And general prep for a tennis player is different than that of a football player, sprinter or swimmer. Each of these sports requires different levels of work capacities which are specific to the tasks involved in said sports. Training items need to reflect these specifics. Period.